Our Riviera 6mm flat weave outdoor, all weather rattan footstool has the natural look of wicker but offers greater durability. Woven with synthetic Rehau all weather wicker fibre over a sturdy aluminium frame this rattan footstool is comfortable, stylish and can be used indoors or left outside year round. 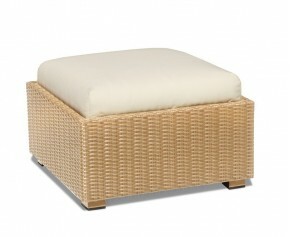 These all weather rattan footstools are stylish, practical and offer a modern twist to standard garden furniture. Expertly woven with durable synthetic fibres over an aluminium frame, these wicker ottomans can be left outdoors all year in any weather, ensuring trouble-free fruitful use.